Complete SOLUT! product listing of disposable paper bakeware, including disposable baking trays, disposable baking pans, and custom-sized disposable bakeware as well as disposable catering trays and paper plates. All SOLUT! 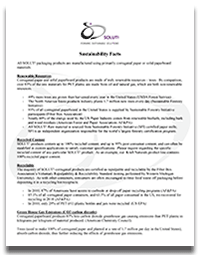 sustainable food service packaging is manufactured using renewable, recyclable corrugated or solid paperboard materials. From SOLUT! 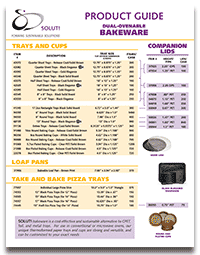 's disposable bakeware to our catering food trays and disposable custom bakeware, SOLUT! food packaging is environmentally friendly and sustainable. 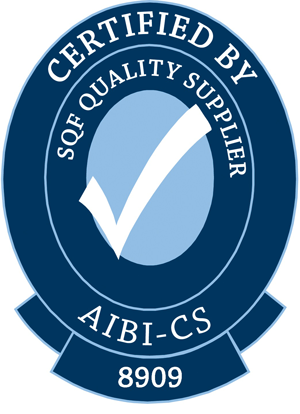 Certificate awarded to SOLUT! for good manufacturing practices and food safety inspection of disposable packaging. SOLUT! 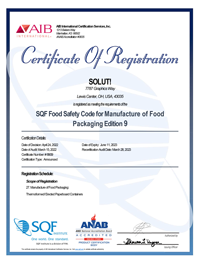 internal food safety manufacturing programs satisfy the standards of SQF Code Edition 8.0, level 3-the highest standard for manufacturers.